Bryan, Jen, & the 3 Henchmen: Progress??? Well, I think we are making progress on the man cave. 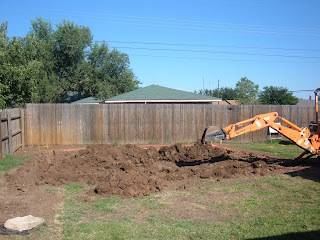 It is that or Bryan just likes driving and digging with large machinery!! See for yourself. 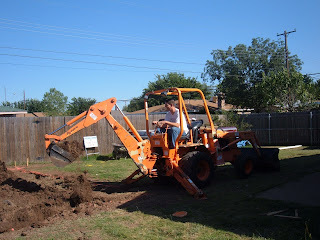 Will Bryan bring that big machine and drive it our backyard and tear it up too?? Looks like progress to me! I'm with Jami, when he's finished he needs to come to TN and work on all our back yards. Great way to meet his other in-laws! You all look well. I can't believe how big Summer and Brandon are! This comment is to get out of the doghouse. I made a comment on Jeremiah & Jennylynn's blog not Jennifer & Bryan's. From the way Bryan enjoys that machinery, he and Bill will always enjoy each other. OK Jennifer, it's been 3 months since you posted pictures of the kids. Don't you think it's about time to put some new ones on? Since we can't see yall in person pictures are the next best thing.